Wow what an object of desire for the Living Room. Would create oerfect mood lighting. SWMBO has different ideas to me about interior decorating. I've already got a signal panel in the living room but there are noises that I need to move that at some point. I just will never understand Women! Why move the Signal Panel, what is the problem? No signals in the living room is probably fair as she lets me have the garden railroad and the speeder in the garage. Wow a speeder, can we see a pic please. Plus have you laid some track down the drive? No track down the drive as that would open up needing a safety case with the NZTA annual audits etc. I actually had 4 speeders at one point a 6-man, 4-man, 2-man and the extended 2-man I've got at the moment. The extended 2-man was built for a signals maintenance gang and was longer than standard to fit a ladder rack. I'm slowly collecting the bits to get it working again and loaded with the period tool boxes, tools etc. Super little beast, thought of doing a Battery Controled Sound one in G? 'Shabby chic' - old furniture, nobody wants, badly painted.. Yes this has been thought about and is on the projects list. I need to find some suitable wheels for it. 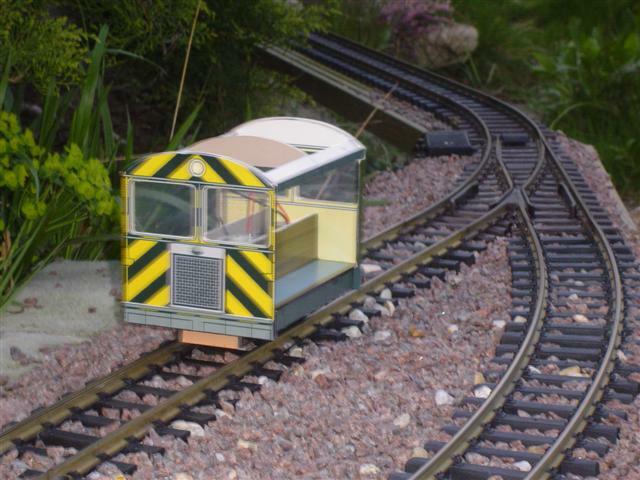 Have you thought about Coarse Scale 0 Gauge ones? On extended Axles would work fine I reckon. I hadn't thought of O gauge wheels. I'll have to dig out the junk box and see what I have that may be suitable. Here's a photo of this weekends work with a slight extension to the garden so we can fit in the signal. brick edging moved and turf dug up. Still need to source some more rocks and we'll need more plants. Nice. Is that a cardboard kit? Yes - the old Locolines kit. Now done by Rail-Road Models. Think I may have one of those lurking around somewhere. Must find it and get it built. I've challenged Ben to apply the Barber Pole stripes to the pole, liked they used to have.